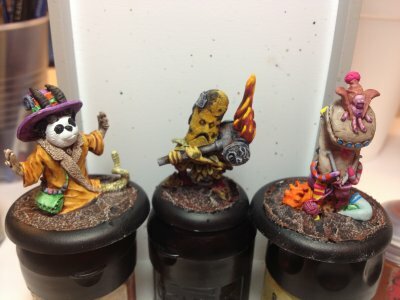 Home › Forums › Games and Other Creations › Low Life Miniatures › Paint! This topic contains 0 replies, has 0 voices, and was last updated by maccioniath 5 years, 9 months ago. No fair! Mine aren’t here yet! Just kidding… paint job looks great. Keep the pics coming. But you were my best friend two kickstarters ago … it was one of the rewards! Thom, I’m very fickle. “I’ll be your best friend”s are a limited duration commodity. Looking at those bases, I think I’m going to sculpt a couple to mold and cast. 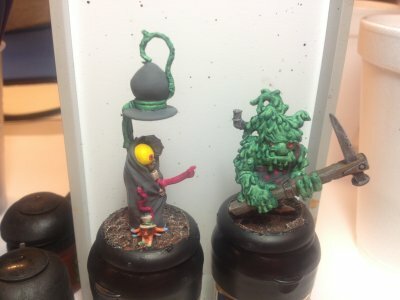 I was shorted a couple of bases, but all that did was inspire me. I made a small set of “modern street/sidewalks” for another project and I thought they turned out quite well, not to mention were pretty fun to make. I need to justify buying all that silicone rubber and casting resin somehow. I didn’t include bases for the flat bottomed minis, but I’m starting to think maybe that was a mistake. I am also considering having some custom Low Life bases made and sold as a separate product. Any interest in sculpting them? And those do, in fact, look fantastic! i prefer the lipped ones like Andy supplied with the rest. Luckily There are plenty of suppliers that make them in different sizes. 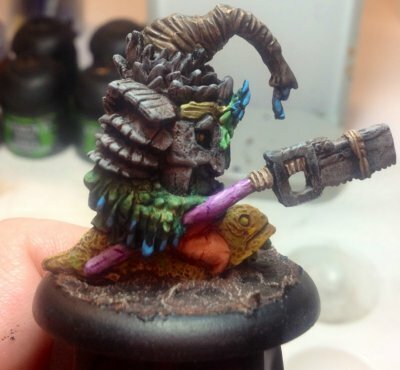 These are from Privateer Press. I realized as I was painting that I missed a few spots with the pumice gel to give them texture. Rats. Awesome! I love your Sockstrosity! 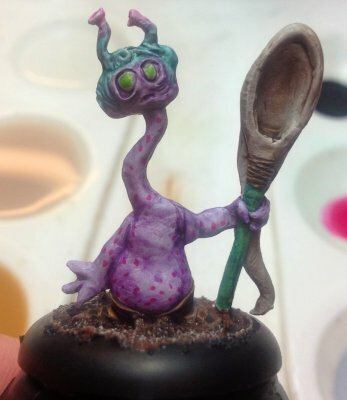 Yeah, Macci kinda nailed it but, like Thom mentioned, if you’ve been in the hobby for an amount of time you most likely have a pile of bases laying around somewhere, and thus is wasn’t a problem for me either. I will work past amateur bashfulness and certainly consider this. I’ll get to sketching, brainstorming, and probably doing a lot of looking at what is around Oithling’s feet in all of the illustrations. The neat thing with the lipped bases (which I prefer too) is that instead of an entirely new base, you can make little inserts that fit down in the hole instead of doing an entire base from scratch. Something else to keep in mind. In the meantime I will ask all of you guys for ideas. What would you guys like? Those are looking sweet (the painting). For the flat based things, I have just some old square bases I’m going to use. Old Skool!